My sons opted to have a joint birthday celebration with a Harry Potter Theme. They are huuuuuge Harry Potter fans, and have forced me to be a fan too! I created this cake after searching the internet for inspiration. It is a two layered round cake, with chocolate and yellow cake layers. It is covered with white fondant with one layer, and red on the other. 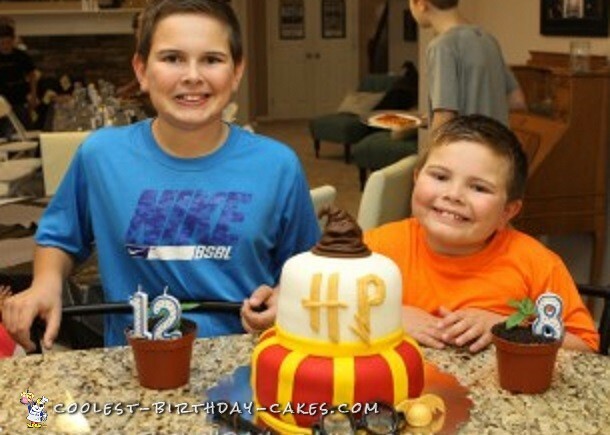 I used yellow ribbon size strips of yellow fondant to create the bottom layer to represent Harry’s scarf in the movie. 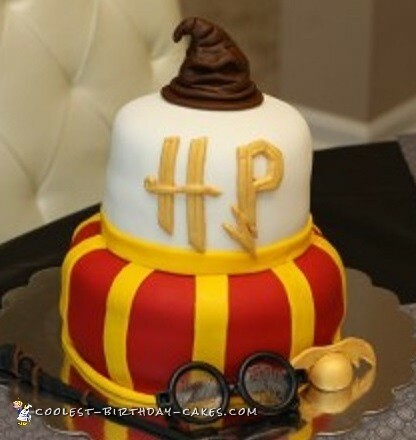 The letters HP fondant that was traced from Harry Potter computer font, then sprayed with Wilton gold spray. I assembled the accessories out of fondant also: wand, sorting hat, golden snitch. The cake was a huge success, and very yummy! If you have never used fondant before, I would recommend practicing with play dough some before cake time. It will take the stress out of cake process before party.